The struggle for independence is more than charts, trends, and abstract academic theories. 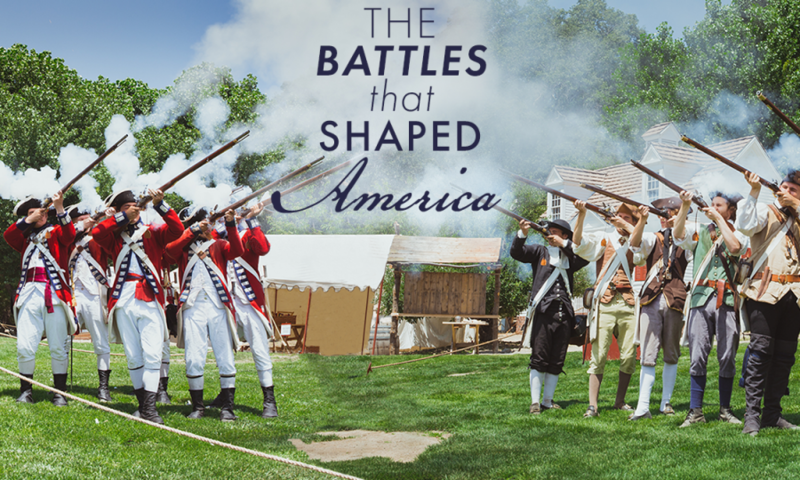 Re-live that great struggle with us and bring the American Revolution alive! As you arrive, you’ll be placed in “townships.” You’ll stay with your township throughout the day and visit a variety of village posts. After everyone has arrived and is on the main green, the regulars will check you for contraband. If smugglers are found, they will be arrested in a brief recreation of the “Gaspee Affair.” The excitement begins when the American minutemen attempt to come to the rescue. After the opening skirmish, you’ll be off to participate in several hands-on stations. Text books come alive as students participate in these fun and challenging activities. After you’re done with your village posts, you’ll have a brief lunch. You’ll be given a soldier’s ration of lemonade, cornbread, cheese, an apple and dried beef. If that’s not enough, visit the Bakery, General Store, of Hawk’s Head Publick House. You can also feel free to bring your own food to supplement your ration. After lunch, students get to participate in a mock battle, a recreation of the 1775 Battle of St. George’s Tavern. 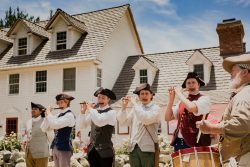 Colonial Townships will use their martial drilling training to defend the tavern behind a dry stone wall while the Redcoat Townships will attempt to march on the tavern. Experience the injustes of the meritime Admiralty Court led by loyalist judge Robert Auchmooty. Students will be put on trial for smuggling, and attempt to win their freedom before a kingsman who acts as judge, jury and prosecution. King George ordered the Colonists to surrender their homes to British Regulars whenever called upon. Americans would have to house and feed the soldiers under the Quartering Act law, even if they had to temporarily live elsewhere. You may even witness firsthand the type of illegal search of private quarters that gave rise to our Fourth Amendment! Fall in line and learn to march, turn, and fire your musket as a enlistee into the township militia. This training may prove useful if the Regulars intend on attacking the township! Learning the trade of a Blacksmith entailed committing to a seven-year apprenticeship. What how iron was forged into useful tools, or how pewter was transformed from molten metal to toy soldiers. “All work and no play makes Jack a dull boy.” Experience various games children would play during the 18th century. Try your hand at Trapball, Hoop and Stick, the Game of Graces, and more! As a young boy, not yet sixteen years of age, George Washington copied out a set of instructions regarding proper social behavior in a book he titled, ‘The Rules Civility and Decent Behavior in Company and Conversation.” Learn the proper way to conduct yourself in the atmosphere of 18th century social protocol. After England announced its intention to govern in various avenues in American living, King George took an investment in cloth. Many Colonists took to a patriotic stance to refuse trade with English broadcloth. At least 15 minutes prior to the start of your tour. We require 60 people to book a tour. Once that anchor group has set a date, any number of participants may join that tour up to our maximum of 850 people. There is on site food at the Bakery and Restaurant which can be ordered or purchased throughout the day. A “soldier’s ration” of cornbread and beef jerky is normally provided unless we are otherwise instructed by your school or group leader. Many schools do bring lunches for the students, as the ration provided is modest. You will be given a picnicking area for whichever you choose. See Map for driving directions. What is the typical age group for this tour? This tour’s educational content is geared towards 5th grade curriculum, but is fun for all ages, young and old. Do I need to group my students a certain way before I get there? We group all of our guests into labeled “townships” of roughly 35 each. If you would like to do that before your arrival, it will save a few minutes in the parking lot upon arrival, but it isn’t required. All of our tour leads are prepared to greet and assist you when you arrive. They will provide you with all necessary paperwork and directions, and assist your students with lining up into straight lines behind the township flag for your group(s). Do I need to cover any specific topics with my students before the trip? Not unless you wish to. As with all of our programs, our historians teach as they go. Extra knowlege can help, but is not required. Groups need reservations, but individuals may join a tour in progress if space is available. My compliments on the superb “American Revolution School Tour” that John Muir Middle School experienced on Wednesday. You, Sgt. Major Harmon, Master Villareal, Master Drazin, and Miss Shaddix all played your roles brilliantly. I’ve been teaching American History for over thirty years, and have visited Williamsburg, Jamestown, Plymouth, Sturbridge, Mystic Seaport and other “living history” sites as a tourist, so I feel qualified to give you an enthusiastic “thumbs up” on the quality and quantity of information that was entertainingly presented at each of the rotation sites. You certainly make effective use of the three-and-a-half hours! Thank you for a wonderful field trip yesterday! Since I am New England born and bred, I wondered how you could live up to my Revolutionary War expectations. Well I must say you surpassed them! Thank you from the entire 5th grade class at the Academy of Academic Excellence! We had a great time! All of you did a bang up job and we plan on returning next year. Thanks again! It goes a long way when you show a child a book with information about the history of the world they live in. When you give that same child the opportunity to see it first hand, hear, and feel the sounds of the past now you have given that child a lesson that will last a life-time. God Bless You! history to life for my students. “A visit to Colonial Chesterfield…is the perfect way to start our year. As we study the Revolutionary Period and pioneer days…I often see students’ faces light up as they recall adventures (“we shot at the British from behind that stone wall”) and other lessons learned “out at the farm.” You make history “come alive” …thanks! “Thank you for the most wonderful field trip I have ever hosted for children. Your knowledge of history, the authenticity of your facilities, the beauty of the surroundings, and the love of history that you shared with the students are very much appreciated. All 112 students and teachers from Discovery Elementary School thank you! was enchanting. I felt like a guest at your home rather than a visitor at a tourist location. And by the way, the apple pie was one of the best I’ve ever had! Already have a tour Booked? Make a Deposit! For groups smaller than 15 persons, please choose the “Family/Individual” option.